Book one of my 2012 Reading Challenge is completed. Pretty good for only the second day of January, right? Maybe I should up my reading challenge goal? Maybe not quite yet. I have set myself at a good pace but I've also been off for a few days and since that's about to change tomorrow my reading pace might change too. But then again I only work from 9-2, so I do have quite a bit of free time to get some reading done. This is book one of In the Garden trilogy, which all three were given to me by one of my brother-in-laws and I am enjoying them quite a bit. Obviously, I read the first one in only like three days. 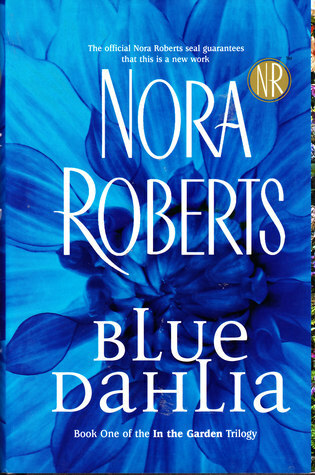 But then again this is Nora Roberts and I haven't found one of those I haven't enjoyed. She's addicting. It's so easy to read her books in just a couple days because you just can't put it down. Her characters are always interesting. And her story lines definitely pull you through. This book introduces three women: Stella, Roz, and Hayley. They are different in age but all come together over flowers and form a bond and a friendship. They have been through similar situations and all find themselves alone. When Stella comes to work for Roz, she begins to change her life and the lives of her two sons, especially when she finds herself attracted to Logan who is the business's landscaper. They start a relationship, but soon Stella realizes that there is a presence in the house that is unhappy about their building relationship. So the women begin the investigation into who the presence is and what she wants. I look forward to starting the next one (Black Rose) as soon as possible, which continues the story of the three women and the mystery of their presence. It was a quick ready and definitely enjoyable.